Imam Hussain (PBUH) (Arabic: حسين )‎; sometimes spelled Hussein, was the son of Imam Ali (PBUH) (fourth Rashidun Caliph of Sunni , and first Imam of Shia Islam) and Lady Fatimah (PBUH) (daughter of the prophet Muhammad (PBUH) and the younger brother of Imam Hassan Mojtaba (PBUH). Imam Hussain (PBUH) is an important figure in Islam, as he is a member of the Ahl Al-Bayt (the household of Prophet Muhammad (PBUH) and Ahl al-Kisa) as well as being the third Shia Imam. Imam Hussain (PBUH) is highly regarded by Muslims and many non-Muslims because he refused to pledge allegiance to Yazid the Umayyad caliph, because he considered the rule of the Umayyads unjust. As a consequence, he left Medina, his home town, and traveled to Mecca. There, the people of Kufa sent letters to him, asking his help. So he traveled toward Kufa. At Karbala his caravan was intercepted by Yazid’s army. He was killed and beheaded in the Battle of Karbala in 680 (61 AH) by Shimr Ibn Thil-Jawshan, along with most of his family and companions. The annual memorial for him, his family, his children and his companions is called Ashura (tenth day of the month Muharram) and is a day of mourning for Muslims and many non-Muslims. The tragedy in Karbala has had an impact on religious conscience of Muslims beyond its sacredness among Shia. In the long term, the cruel killings at Karbala became an example of the brutality of the Umayyad and fueled the later Shia movements. Anger at Imam Hussain’s (PBUH) martyrdom was turned into a rallying cry that helped undermine and ultimately overthrow the Umayyad Caliphate. According to most reports, Imam Hussain (PBUH) was born in 626 A.D (3 Sha’aban, 4 A.H). 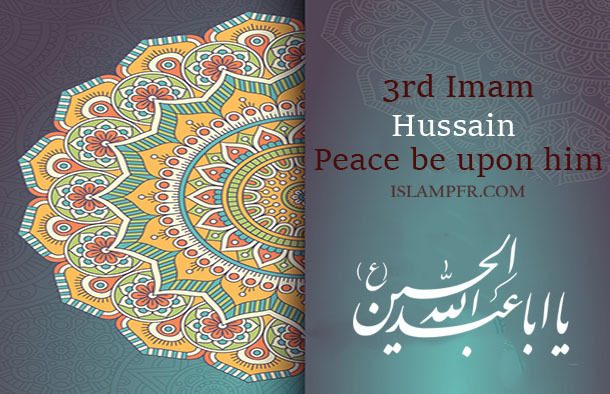 Imam Hussain (PBUH) and his brother Imam Hassan (PBUH) were the last descendants of Prophet Muhammad (PBUH) living during his lifetime and remaining after his death. There are many accounts of his love for them which refer to them together. Prophet Muhammad (PBUH) is reported to have said that whoever loves them has loved him and whoever hates them has hated him. A famous narration declares them the “Masters of the Youth of Paradise”; this has been particularly important for the Shia Muslims who have used it in support of the right of Prophet Muhammad’s descendants to succeed him. Other traditions record Prophet Muhammad (PBUH) with his grandsons on his knees, on his shoulders, and even on his back during prayer at the moment of prostrating himself, when they were young. Prophet Muhammad (PBUH) loved them and declared them as his Ahl al-Bayt very frequently. Shia popular view is the members of the Prophets family that were present at the incident of Mubahala. According to Muhammad Baqir Majlisi who compiled Bihar Al-Anwar, a collection of Hadith, Chapter 46 Verse 15, Surah Al- Ahqaf and Chapter 89 Verses 27-30, Surah Al-Fajr of the Quran are regarding Imam Hussain (PBUH). After Imam Ali (PBUH) was assassinated by Kharijites in 661, Six months later in 661, Imam Hassan Mojtaba (PBUH) who highly regarded for his wisdom, the Second Imam of Shia and the grandson of Prophet Muhammad (PBUH), had to make a treaty with Mu’awiyah (from Umayyad, who made himself the caliph by force and threat) . This treaty was on the conditions just to keep the people safe and secure. However, Muawiyah broke the conditions and began the Umayyad dynasty, with its capital in Damascus. This brought to an end the era of the Rightly Guided Caliphs for Muslims. On his deathbed Mu’awiyah appointed his son Yazid to succeed him. Yazid was oppressive, and Imam Hussain (PBUH) felt that it was his duty to confront him, because Muslims are asked by God to stand against oppression and fade it. The state that Prophet Muhammad (PBUH) established was in accordance with Islamic economic jurisprudence. As the state expanded, the rights of the different communities, as they existed in the Constitution of Medina still applied. The Constitution of Medina instituted a number of rights and responsibilities for the Muslim, Jews, Christian and pagan communities of Medina, bringing them within the fold of one community. The Constitution established: the security of the community, religious freedoms, the role of Medina as a sacred place (barring all violence and weapons), the security of women, stable tribal relations within Medina, a tax system for supporting the community in time of conflict, parameters for exogenous political alliances, a system for granting protection of individuals, and a judicial system for resolving disputes where non-Muslims could also use their own laws. All the tribes signed the agreement to defend Medina from all external threats and to live in harmony amongst them. The same rights were later applied to all the communities as the state expanded outside Medina. The Quran also gave rights to the citizens of the state and these rights were also applied. 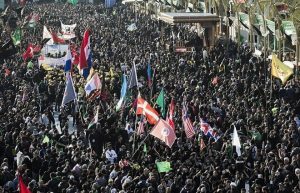 But Yazid was oppressive and he broke peace, so Imam Hussain (PBUH) felt that it was his religious duty to confront him and send a message to the future generations that oppressive rulers who take away the rights of people should not be given allegiance, because their oppression burn all people with every belief. Imam Hussain (PBUH) left Medina with his sisters, daughters, sons, brothers, and the sons of Imam Hassan (PBUH) and the companions for Hajj. He took a side road to Mecca to avoid being pursued, and once in Mecca Imam Hussain (PBUH) stayed in the house of ‘Abbas ibn ‘Abd al-Muttalib and remained there for four months. In Mecca Abd Allah Ibn al-Zubayr, Abdullah Ibn Omar and Abdullah Ibn Abbas asked Imam Hussain (PBUH) to make Mecca his base and fight against Yazid from Mecca. Imam Hussain (PBUH) opposed Yazid and declared that Umayyad rule was not only oppressive, but also religiously misguided. The integrity and survival of the Islamic community depended on the re-establishment of the correct guidance. Imam Hussain (PBUH) also knew that the succession of Yazid was an attempt to establish an illegitimate hereditary dynasty. 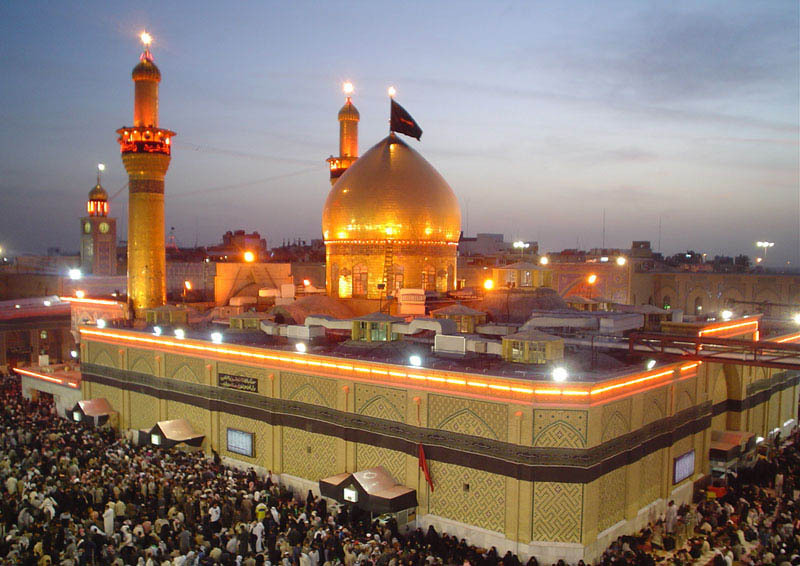 On the other hand, The religious attitudes of the Umayyad caused the people of Kufa finally believe that leadership of the Muslim community belonged to the infallibles from descendants of the Prophet Muhammad (PBUH), so, by sending thousands letters to Imam Hussain (PBUH), they asked him to join them, come to Kufa and help them to be released from cruel rulers. When Imam saw people ask for his help, sent one of his companions, Moslem Ibn Aqeel (Imam Hussain’s cousin and one of his best companion) to Kufa to check the situation and see how many people really want Imam Hussain (PBUH) to be their leader and caliph. Yazid was informed by his spies. So he replaced Ubaydallah Ibn Ziyad in Kufa, ordering the latter to disperse the crowd supporting Moslem Ibn Aqeel. Ubaid-Allah treated people and killed some of them to dissuade them about Imam Hussain (PBUH). Then Moslem was found and delivered to Ibn Zyad, and while Moslem was going to send a message to Imam Hussain (PBUH) with the following: “return with your family, and don’t be deceived by the people of Kufa. They have misled you and me”, Ibn Ziyad killed him. However, the message was not received to Imam Hussain (PBUH) when he decided to leave Mecca. Imam Hussain (PBUH) in his path toward Kufa encountered the army of Ubaydallah Ibn Ziyad, the governor of Kufa, led by Horr, a top commander in the Umayyad army who later changed sides. It is said that when Horr and his one thousand men army initially encountered Imam Hussain (PBUH) and his family and companions on the day of 4th Muharram. Horr and his army were thirsty as they had been on the way to capture Imam Hussain (PBUH) for many days, So Imam Hussein (PBUH) offered his storage of water to Horr, his army, and their horses. It is said that if Imam Hussein (PBUH) had not offered the water to Horr and his army, the water in Imam Hussein (PBUH)’s camp would have lasted until 19th day of Muharram. Horr did not arrest Imam Hussain (PBUH) first, he was waiting for new orders, but told Imam to set a camp in Karbala and stop his journey to Kufa, also he was ordered to prevent Imam Hussain from going back . Imam Hussain (PBUH) and his family were also not allowed to set up tents close to the bank of the Euphrates. The night before 10th of Muharram (Lunar month) Imam Hussain (PBUH) gathered his men (companion) in a tent, they were more than one hundred people, then told them: “tomorrow a bloody war will happen and all of us will be killed but paradise is waiting for us. However if everyone who is debtor or wants to get back for any reason but he is embarrassed to leave, I blow the candle to make it easier for you.” Sometimes people have faith but not so deep, when Imam Hussain (PBUH) lighted the candle only 72 people were sitting, the rest left their leader. Ibn Ziyad’s army also killed Imam Hussain’s (PBUH) six -month-year- old son, when Imam Hussain (PBUH) asked for water for his little son, but the army launched arrows toward Imam Hussain’s (PBUH) son, the arrow torn the throat of little Ali Asghar (PBUH) while he was in the hands of Imam. The battle of the Karbala land, started by Ibn Zyad’s army in the order of Yazid. It is written in the history the number of the enemy’s army was more than 20,000 people …. 20,000 against 72…. One of those 72 people was Horr (the commander of Ibn Zyad’s army). He was ordered to stop Imam Hussain (PBUH) and then take him to Yazid but before the battle he found out they were sent there to kill Imam and his family. When the new army of Ibn Zyad joined them and the commander said they are all ordered to kill Imam Hussain (PBUH), Horr doubted. He thought how could he kill the grandson of the prophet, the son of Lady Fatima and Imam Ali (PBUT), how could he kill an Imam who is determined by God? Finally the light of truth glowed in his heart and he regretted so much. In the morning of the battle, without telling anyone, he ran to the Imam’s camp. He fell to the ground in front of Imam, cried and asked Imam Hussain (PBUH) to forgive him. Imam Hussain forgave him and asked God to forgive him too. When the enemy attacked, Horr asked Imam Hussain (PBUH) to let him go for the fight as the first one. He got permission and he went to the battle, finally he martyred in the path of truth. 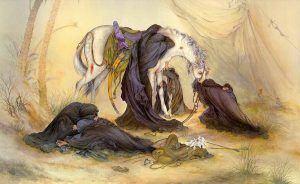 Imam Hussain (PBUH) lost his sons, his brother’s sons, his companions in this battle which was forced to him and his family and finally the enemy killed him by many arrows and sword, at last they cut his head and crossed on his holy body by horses. At the Battle of Karbala it is recorded that seventy two people from the Imam Hussain’s men were killed, the whole companions of Imam Hussain (PBUH). On 13 October 680 (Muharram 10, 61 AH), he and his small group of his followers and family members, who were between 72, fought with a large army under the command of Umar Ibn Sa’ad, son of Sa`d Ibn Abi Waqqas. Imam Hussain (PBUH) and all of his men were killed and beheaded. The bodies were left without burial and survivors from Imam Hussain’s family (women such as his sisters, his little daughters, his only left son Sajjad (PBUH) who was sick during the battle and he couldn’t take part in) were taken as prisoners. The forces of Yazid raised the head of Imam Hussain (PBUH) on a lance, they took it to Kufa to present it to Ibn Ziyad, the governor of Kufa, leaving behind the mutilated body of Imam Hussain (PBUH) and his followers. In Kufa, Ibn Ziyad dispatched the head to Damascus to be presented to Yazid as a trophy. Through the way of Kufa and then Sham, prisoners (women and children …) who was tied by chains, bare foot on thistles were under disrespect and harassment. When the little daughter of Imam Hussain (PBUH) was crying for the head of her father, soldiers whipped her. The brutal behavior of Yasid’s soldiers is recorded in historical books. After the exhibition and display of the head of Imam Hussain (PBUH) in Damascus, Yazid celebrated the occasion with great pomp and show by displaying the head of Imam Hussain (PBUH) in his crowded and decorated court. He gathered people and began to insulting Imam Hussain (PBUH) and his family. That was the time Lady Zeinab (PBUH), Imam Hussain’s sister began to speech so eloquent and bravely. This speech is written in the historical books and it is so famous because it caused many people understand what really have done. Lady Zeinab (PBUH) revealed the legitimacy of the Prophet Muhammad’s descendants (Ahl al-bayt), and dishonor of Umayyad. After that, the history never forgot the crimes of Umayyad dynasty. “Praise be to Allah, the Lord of the worlds and blessings on my grandfather, the Chief of divine prophets….O Yazid! Allah says, and his word is true, that: “Then evil was the end of those who did evil because they rejected the communications of Allah and used to mock them” [30:10]. O son of freed slaves! Is this your justice that you keep your own daughters and slave maids veiled while the daughters of the Prophet of Allah are being paraded from place to place exposed? You have dishonored us by unveiling our faces. Your men take us from town to town where all sorts of people, whether they be residents of the hills or of riversides have been looking at us…. ….O Yazid! If you had heart enough to take account of your nefarious deeds, you yourself would surely wish your arms to be paralyzed and severed from your elbow and you would wish that your parents had not given birth to you because you would know that Allah has become displeased with you. Allah, Grant us our rights, avenge those who have oppressed us…. The oppressed will be avenged and the enemies will be punished. … Allah is sufficient to deal with you. The Messenger of Allah is your antagonist and the angel Gabriel is our support and help against you.… Those who have made you the head of state and burdened the Muslims with your leadership will soon find out what awaits them. The end of all tyrants is agony. “O Yazid! If you consider our defeat as your achievement then you will have to pay its price… Beware of the day when the announcer would announce the curse of Allah on the oppressors and the unjust. Imam Hussain (PBUH) martyred in 680 A.D (10 Muharram 61 A.H) in the age 57. Several Shia and Sunni sources confirm the return of Imam Hussain’s head to his body in Karbala. However, there are some different narrations about how it is done. According to Shaykh Saduq, Imam Hussain’s (PBUH) son, Imam Sajjad (PBUH) (the only man who survived from Karbala, because during the battle he was sick and he couldn’t fight), took the head back from Sham and returned it to Karbala. Neyshabouri and Majlesi have confirmed this in their books, Rouzato-Waisin and Bihar al-Anwar respectively. Sharif al-Murtaza also mentions this in his book Rasaa’el. Ibn shahrashub verifies Sharif al-Murtaza stating the same thing about the head of Imam Hussain (PBUH). He also narrates Shaykh Tusi that this event, i.e. returning the head to the body, happened forty days after Ashura (the day of battle). Similar statements are documented by famous Shia scholars e.g. Ahmad Ibn Tawoos and Muhaqeq Helli. Among Sunni scholars, Abu Rayḥan al-Biruni in his famous work The Remaining Signs of Past Centuries has stated that Imam Hussain’s (PBUH) head was returned to his body and was buried altogether on 20th of the lunar month of Safar (the day of Arba’een). Similar statement is mentioned by Sunni scholar Zakariya al-Qazwini, in his book ʿAja’ib al-makhluqat va ghara’ib al-mawjudat. Qurtobi narrates from Shias on the return of the head to the body on the 40th day after Ashura. Another narration says, the head was buried in a niche of one of the internal walls of Jame-Masjid, Damascus, Syria. Afterwards, the head of Imam Hussain (PBUH) remained confiscated and confined in Damascus by the order of the Umayyad monarch, Sulayman Ibn Abd al-Malik, in this condition for about two hundred twenty years. When the Abbasids took power from the Umayyad, in the garb of taking revenge of Ahl al-Bayt, they also confiscated the head Imam Hussain (PBUH) and proved to be worse enemies than the Umayyad. It was the Abbasid emperor Al-Muqtadir, an enemy of the Ahl al-Bayt He attempted many times to stop the pilgrimage to the head, but in vain. He thus tried to completely eliminate the sign of the sacred place; so he transferred the head of Imam Hussain (PBUH) to Ashkelon (located 10 km from the Gaza Strip and 58 km south of Tel Aviv) in secrecy, so that the pilgrims could not find the place. Commander of the Fatimid forces Badrul’jamali (1095 A.D) conquered Palestine, during the period of Ma’ad al-Mustansir. He assigned him to discover the head of Imam Hussain (PBUH). Under the instructions of the Fatimid a mosque was constructed and donated several huge properties. Also a wooden minbar (pulpit) was prepared and placed in the mosque, where the head of Imam Hussain (PBUH) was buried. This minbar bears the historical account which is engraved in Arabi Fatemi Kufic script about the Raas al Hussain (PBUH) (the place of the head). Historians, Al-Maqrizi, Ahmad al-Qalqashandi, and Ibn Muyassar have mentioned that the casket reached Cairo on Tuesday 10 Jumada al-Thani (2 September 1153). Ustad Maknun accompanied it in one of the service boats which landed at the Kafuri, Buried there in the place known “Qubbat al Daylam” or “Turbat al Zafran” (currently known as “Al Mashhad al Hussain (PBUH)”. During the era of the Fatimid Caliphate, on the day of Ashura, every year the people of Egypt from far and near used to gather and offer sacrifices of camels, cows, goats in the name of Allah, recite Marsiyah-elegies on the Ahl al Bayt and the companions of Imam Hussain (PBUH) and pronounced L’anat (curse) loudly on Yazid, Shimr Ibn Zil-Jawshan (who cut the Imam’s head), Ibn Ziyad and other murderers of Imam Hussain (PBUH). During the tenure of Saladin, all mourning commemorations for Imam Hussain (PBUH) were declared officially banned. By the way, the only thing is trustworthy, the head is beside the body now. After 5 years, Mukhtar Al-Thaqafi one of the Shia Muslims, who was in Ibn Zyad’s jail during the battle of Karbala, could gather other Shia Muslims who was warrior like his best friend Kian (Iranian Shia) then came to Kufa. He gained the authority of a leader and took a sudden vengeance on those who were involved in killing of Imam Hussain (PBUH) and his companions. Omar Ibn Sa’ad and Shemr were executed. Ibn Ziad was also killed in the battle and his head was taken to the very place in Kufa where Ibn Ziad had received the head of Imam Hussain (PBUH). the other people who had role in killing of Imam Hussain’s family, were killed by Mokhtar. At last, Mokhtar martyred in the way of God. The headless body of Imam Hussain (PBUH) was buried in the place of his martyrdom in Karbala, by the tribe of Bani Assad, who were living in the vicinity of that place. They planted a Jujube tree on top of the grave as a sign. Imam Hussain’s (PBUH) grave became the most visited place of pilgrimage. The Shrine was later built over the holy grave. In 850 A.H Abbasid caliph, Mutawakkil destroyed the shrine in order to stop Shia pilgrimage. However, pilgrimage continued. During the centuries, this shrine destroyed and rebuilt again and again until Shia got more power and could protect the holy shrine. Today, the death of Imam Hussain (PBUH) is commemorated during every Muharram, this day is named Ashura (10th day). The commemoration of Imam Hussain (PBUH) has become a national holiday and all ethnic and religious communities participate in it. It is said by later Imams that a pilgrimage to Karbala and Imam Hussain’s (PBUH) shrine there in has the merit of a thousand pilgrimages to Mecca, thousands of martyrdom, and a thousand days of fasting. The effect of the events in Karbala on Muslims has been deep and is beyond the passion in Shiaʿism. It is clear that Imam Hussain (PBUH) cannot be viewed as simply a rebel risking him and his family’s lives for his personal ambition. He did not pledge allegiance to Yazid, who had been chosen as successor by Muawyah in violation of his treaty with Imam Hassan (PBUH). Yet he also did not actively seek martyrdom and offered to leave Iraq once it became clear that he no longer had any support in Kufa. His initial determination to follow the invitation of the Kufa people in spite of the numerous warnings he received depicts a religious conviction of a mission that left him no choice, whatever the outcome. Arba’een (Arabic: الأربعين, Persian: چهلم‎, Urdu: چہلم‎) “the fortieth day”, is a Shia Muslim religious observance that occurs 40 days after the Day of Ashura to commemorates the martyrdom of Imam Hussain (PBUH) which falls on the 20th day of the month of Safar. Forty days is the usual length of the time of mourning in Islamic cultures. Arba’een, is one of the largest pilgrimage gathering on Earth, in which over 25 million people go to the city of Karbala in Iraq. Establishing justice and fighting injustice, no matter what its incarnation—a message that strongly influenced subsequent Shia uprisings against the Umayyad and Abbasid rule. In the first Arba’een gathering in the year 62 AH, Jabir Ibn Abdullah, a companion of the Prophet Muhammad (PBUH), was one of the people who performed a pilgrimage to the burial site of Imam Hussain (PBUH). His visit coincided with the surviving members of the Prophet Muhammad’s family and Imam Hussain’s (PBUH) son, Sajjad (PBUH) who was the leader (Imam) of Muslims after his great father Imam Hussain (PBUH). Every year, many pilgrims travel miles on foot to reach Karbala in Arba’een day. 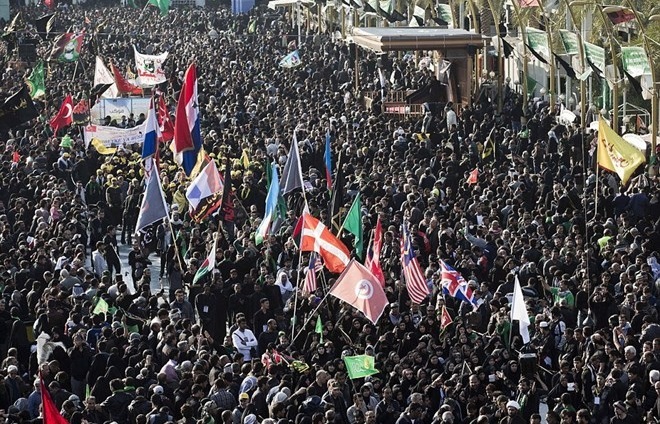 Arba’een is consistently among the largest peaceful gatherings in history. In Arba’een 2016, over 25 million pilgrims reached to the Karbala, Iraq. Zuljanah (Arabic: ذو الجناح‎) a white stallion, was the horse of Imam Hussain (PBUH). It means owner of two wings. It is said its sound of neighing was sweet, furious and high making it different from other horses. It was purchased by the Prophet Muhammad (PBUH) from an Arab called Haris. According to the narrations, when Imam Hussain (PBUH) was a child, he used to go to the stable of Zuljanah and look at it. Once the Prophet said that his grandson was curiously looking at the horse as if some mysterious conversation was taking place, so the Prophet asked the child if he wished to ride the horse and on being answered the Prophet Muhammad (PBUH) ordered the horse to be mounted, when Imam Hussain (PBUH) approached the horse it amazingly lowered itself to the ground allowing the child to mount him. In the battle of Karbala, Imam Hussain (PBUH) used the horse and went to the battlefield. According to a collection of Hadith, Zuljanah on its own killed 60 enemies of Imam Hussain (PBUH) in the Battle of Karbala. Zuljanah wept in sorrow of Imam Hussain’s (PBUH) martyrdom. After the martyrdom of Imam Hussain (PBUH), Zuljanah went to the camps of Lady Zaynab (PBUH) then went to the Euphrates River and never to be found again. Historian Edward Gibbon was touched by Imam Hussain (PBUH), describing the events at Karbala as “a tragedy”. Mahatma Gandhi attributes the historical progress of Islam, to the “Sacrifices of Muslim saints like Imam Hussain (PBUH)” rather than military force. The traditional narration “Every day is Ashura and every land is Karbala!” is used by the Shia as a mantra to live their lives as Imam Hussain (PBUH) did on Ashura, i.e. with complete sacrifice for God and for others. The saying is also intended to signify that what happened on Ashura in Karbala must always be remembered because in each land always there is right and wrong sides and every day we have to choose between them and fight with the opposite one.